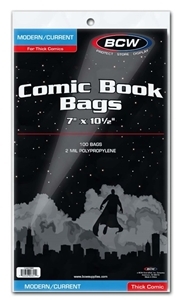 The BCW Current Comic Bags are an acid free, archival quality product made of crystal clear polypropylene. Use this item to protect and store your collectible regular comics. This slightly wider bag will fit even giant-size current comics, and it is what we use for bagging our subscription comics.